An Amtrak train bound for Washington, D.C., had a minor derailment as it was leaving New York's Penn Station at the height of Friday's morning rush, bumping an NJ Transit train and shattering windows but causing no serious injuries, authorities said. NJ Transit said one of its trains on the Montclair/Boonton line was coming into the Manhattan transit hub shortly after 9 a.m. when the departing Acela sideswiped it between the north tube and the station. Amtrak said its Acela Express Train 2151 from Boston "had a minor derailment while moving at a slow speed" leaving Penn, and then "made contact" with the NJT train. "The rear of the train was still on the platform, and all 248 passengers have exited the train onto the platform and into the station safely," the statement said. "Service into and out of New York Penn Station will be delayed while we investigate this incident." Photos posted to social media showed the accordion-like component between the cars of the Amtrak train crunched in one spot. More severe damage was apparent on the NJ Transit train; photos showed twisted pieces of metal in parts, and passengers said some windows of the back cars were knocked out. The Federal Railroad Administration said it sent investigators to the scene. Jordan Geary was sitting next to his wife on NJ Transit train 6214 when he says he heard a loud "explosion" next to his head. Some of the windows were disconnected and some smashed, Geary said, adding, "Thankfully everyone is okay." 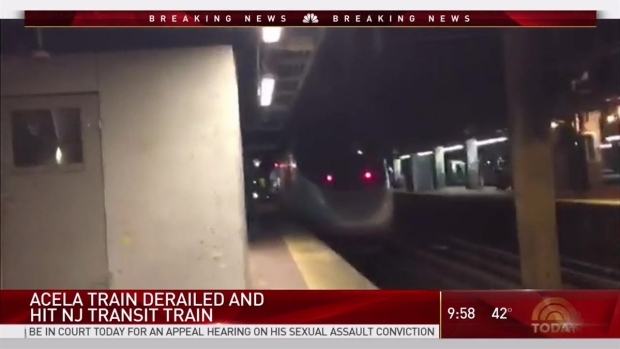 NJ Transit said about 1,000 people were on the train at the time and several minor injuries to customers and crew were reported, but everyone was expected to be OK.
Scott Parsons, a passenger in the last car of the train, described hearing a loud screech. Bright sparks followed, he said, and the lights went out. PATH was cross-honoring tickets for both Amtrak, including Keystone Service, and NJ Transit riders, but photos showed PATH trains were jam-packed by late morning, and the evening commute was expected to be a nightmare. Click here for the latest transit alternatives. Arrival and departure screens in Penn Station were littered with cancellations and delays. The MTA said Long Island Rail Road service was also experiencing delays.